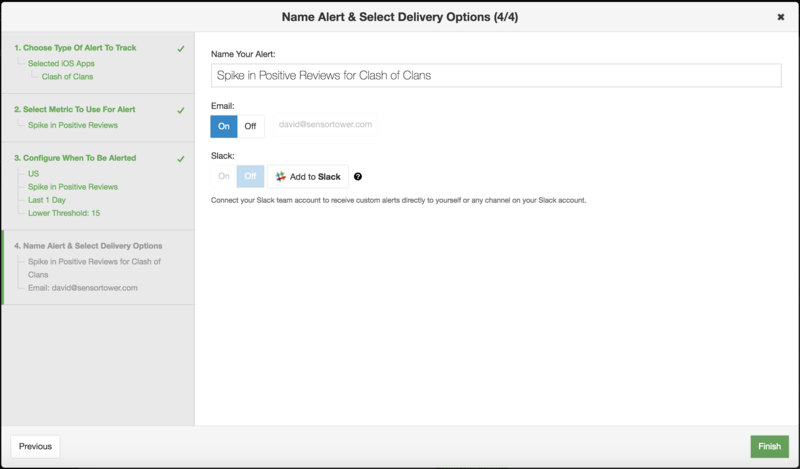 With our Custom Alerts feature, you can receive email or Slack notifications when a competitor launches a new app or adds a new localization, when a publisher hits a new benchmark in downloads or revenue, when an app sees a spike in reviews or revenue, and much more. You can access Custom Alerts by either clicking on the Bell Icon next to your email address in the top right-hand corner of the screen or selecting Dashboards & Alerts from the left-hand side bar and clicking Custom Alerts - Configure. To get started, you will need to configure and add new alerts. Click on Add New Alert. You can then choose to add alerts by app, publisher, category, or report. 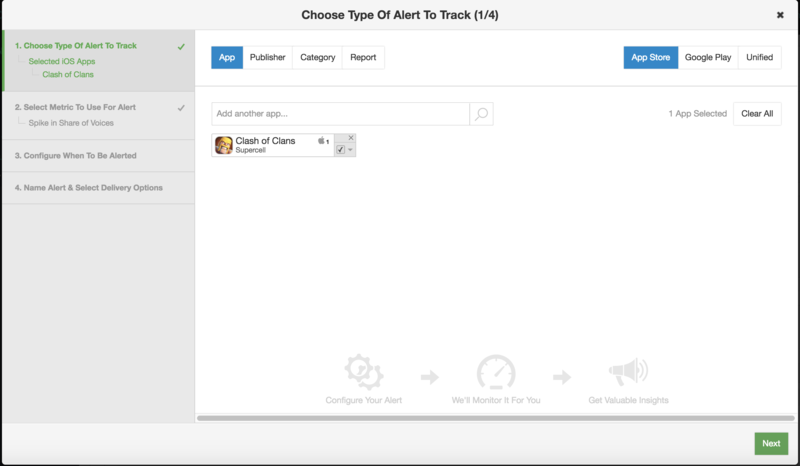 You can also select multiple apps or publishers and group them into a single alert. After adding the app, publisher, category, or report of your choice, you will be prompted to select an alert type. You can choose from a number of alert types, including changes in category ranking, downloads and revenue, user ratings and reviews, app updates, and more. (These do depend on your level of access to each Sensor Tower Product). You can also select when to receive each type of alert. 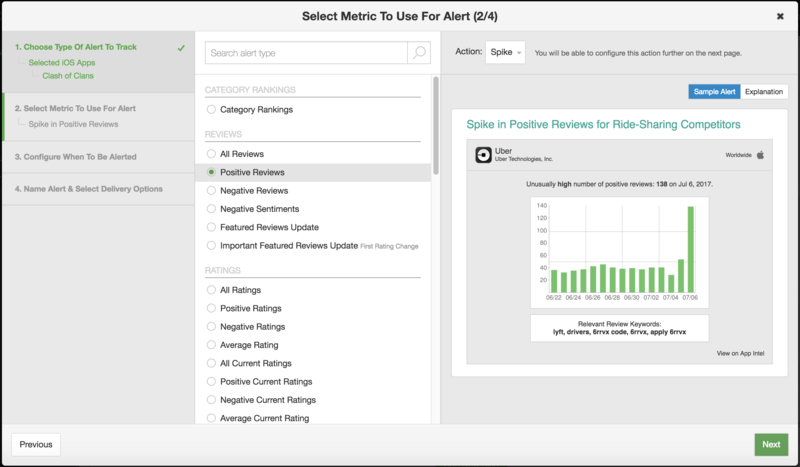 For example, if you are tracking changes in category rankings for a particular app, you can choose to receive alerts when the rankings spike, plummet, or first reach a user-defined value. Next, you can choose the countries included in the alert, the frequency with which the alert will run, and a lower bound threshold value that will trigger the alert. These are all customized based on what type of metric you are tracking. Then you'll Name your Alert and select how you would like the information delivered to you. You can receive alerts at the email address connected to your Sensor Tower account. You can connect Custom Alerts with Slack, and receive alerts in definable Slack channels. Different alerts can be configured to appear in specific channels if you wish. When you are done selecting how you'd like the Alert delivered, click Finish! From the Configure Custom Alerts page, you can manage all of your alerts and view the history of all the alerts that have been sent to you. If you have any further questions about Custom Alerts, please don't hesitate to reach out to support@sensortower.com.